More and more people nowadays are making a living online. Laptops, netbooks, cell phones, tablets and other mobile or hand-held devices are allowing a new generation of enterprising entrepreneurs to work from home or just about anywhere in the world. For the past five years, I too have been making a living off the Internet… and in just the past two years have figured out how to do my work from anywhere on the planet (so long as I have access to an Internet connection). It used to be that you could run an online business from anywhere in the world as long as you had your laptop with you. That was great, but if something were to happen to your laptop while you were traveling, you could be in big, big trouble. Today, digital workers like myself no longer need a laptop of their own to run their online business(es). All you need is access to a Web browser! The Web browser can be on your laptop, your cell phone or a public computer at the library, an Internet cafe, or wherever. Because most of the software I now use to conduct business is based online, I don’t have to worry about carrying my laptop around with me, damaging my computer, syncing my files, or backing up my data. All the information needed to run my business and make money from anywhere in the world is stored online using the latest in online security and backup technologies. The following is a list of the 25 Web-based services I currently use on a daily basis to manage my business and make money from anywhere in the world. Google Mail or “Gmail” as it is called, is my main resource for accessing my email whether at home or on the road. Because I have more than a dozen different email accounts associated with numerous online businesses, I use Gmail to check and respond to them all. All of my email is collected in Gmail, where I can then sort emails according to category, subject, and timeliness. Email is a huge part of my online businesses and Gmail makes it possible to access my important messages from anywhere in the world. I read a lot. More than most in fact. And much of my reading is done online. I use Google Reader to subscribe to my favorite blogs, websites, video feeds and other online information that I find important. Much of this online reading is personal, but much of it is business related as well. I use RSS feeds to track my competitors, find cheap apartments on Craigslist, learn new languages by reading international blogs, and a whole lot more. Google Reader makes it possible for me to access my favorite online resources in a single location and be notified each and every time new content is added to my favorite feeds. I plan out each and every day in advance. Using Google Calendar I schedule appointments, block out time for writing, reading, physical activity, or social interaction. I currently have eight different calendars synced inside my Google Calendar system so as to track my numerous businesses and personal appointments. It used to be that all of my work and school documents were written on Microsoft Word, saved on my computer and emailed back and forth between computers when necessary. Nowadays, however, I use Google Docs to create word documents, spreadsheets and more that can be accessed from any computer, anywhere in the world as long as it has an Internet connection. And unlike Microsoft Word, which can cost a pretty penny, Google Docs is free! When it comes to my online businesses, there isn’t a tool I love more than Google Analytics. Analytics is a another free piece of Google software that is used to track your website’s statistics. I use Analytics to find out how many people are visiting my websites each month, where my reader’s are coming from in the world, find out how long my readers stay on the website and on specific pages, discover which articles and pages are most popular, what web content needs to be reworked, and a whole lot more. When I took my first long distance bicycle tour in 2001, I used pay phones to call home and check in with my parents – letting them know that I was okay. Soon thereafter, the cell phone became a part of my travels. But now that I’m spending more and more time traveling internationally, I hardly use my cell phone at all. Instead, I use a web based service called Skype to stay in touch with friends and family all over the world… and to make business deals with partners across the globe. I use Skype to make phone calls, instant message, video chat, send and receive large and small computer files, problem solve with screen sharing and a whole lot more. Dropbox is a really cool service that allows you to access your personal computer documents from any computer in the world. This is especially useful if you have multiple computers in your home (like I do) and you need to constantly access files on both computers. Instead of emailing the documents back and forth to yourself or manually transferring the files on a USB stick, you simply drag an drop the files you want to share between computers into your “Dropbox” folder and those files are then instantly available for use on any computer you have access to. Best of all, you can access your shared Dropbox files on your own personal computers or any other computer in the world simply by logging into your account at www.dropbox.com. It used to be that Facebook was just a silly social media tool used by college co-eds to chat it up with their classmates between semesters, but over the last couple years Facebook has turned into the number one social networking site in the world. I use Facebook to keep in touch with friends and family, share my travel experiences, promote my business Fan Pages and actually make money through the ads I run on the site. I like Facebook simply because it’s a great way to meet new people and passively learn more about the people I already know. While I was a slow adapter to the use of Facebook in my personal and business life, I was an early adapter in the world of Twitter. I started using Twitter in the summer of 2008 after a business friend of mine said how great it was at connecting with like-minded individuals. Since creating my account, I’ve met thousands of people interested in business, entrepreneurship, travel, bike touring, movies and more. I use Twitter on a daily basis, often times sharing information about what I am doing, things I have learned, motivational quotes I have read, or answering questions. Twitter is one of the number one ways I drive people back to my website and create new online relationships. Because I have multiple Twitter accounts associated with multiple online businesses, I use a free service called Splitweet to send tweets to multiple Twitter accounts without having to constantly log in and out of Twitter on a regular basis. When you have a single Twitter account, a site like Splitweet is pretty pointless. But when you have two or more Twitter accounts that you need to post to on a regular basis, Splitweet is a savior. Instead of logging in and out of 8 or more Twitter accounts, I do all of my tweeting from Splitweet.com. I simply visit the website, write my tweet and then check a box next to the Twitter account I want the tweet to be sent to. It’s really, really easy and saves me a huge amount of time. I also use Splitweet to track specific keywords, such as “bicycle touring,” so I can see what other Twitter users are saying in regards to these keywords and respond if necessary. I’ve already mentioned that email is a huge part of my online businesses. And while regular email is a big part of what I do, automatic emails and giant broadcast emails are even more important to the success of my online ventures. To manage my multiple email lists, I use a service called Aweber to collect new leads, send automatic follow up emails, broadcast bi-monthly messages and track the success of my email campaigns. For example, when you sign up for my free 12-part bicycle touring email mini course, your name and email are added to a database inside Aweber, which then automatically sends you the 12 or more emails that are a part of my course. I’m not actually sending those emails to you every few days. The software does it for me… automatically! With dozens of people signing up for my email course every day, there is no way I could actually send and keep track of that many emails. So that’s where Aweber comes in and helps me out! When people ask me for advice about making money online, the first thing I usually tell them is to sign up for Aweber an start working on their email list. It’s the number one way I make money online. Besides the website here at BicycleTouringPro.com, I have dozens of other websites in my name and all of them are hosted with a company called BlueHost. I’ve used a number of different web hosts over the years and BlueHost.com has always blown the others out of the water. Not only are their web hosting rates incredibly affordable, but the services they offer are vast and their customer service is superb. When it comes to web hosting, I’ve learned that you want to align with a company who has excellent customer service. If it takes you a half hour or more just to get on the phone with a web host, then you’re gonna have some trouble. Over the years, the people at BlueHost have been fast, pleasant, and always ready to help. If you need a good host for your website, I would highly recommend BlueHost.com. While all of my websites are hosted with BlueHost, almost all of my domain names are purchased with GoDaddy.com. What I like about GoDaddy is just how easy it is to keep track of my domain names, make name server changes, seek out new domains, buy expiring domains, and be notified well in advance whenever one of my current domain names is coming up for renewal. A few years back I purchased the domain name “DarrenAlff.com,” but when the web host I purchased the name with failed to tell me that the domain was coming up for renewal, I lost the domain name, was told I could only get it back if I paid more than $3,000, and was forced to wait while the name floated around in cyber-space without an official owner for more than two years before I was able to buy it back with GoDaddy. The lesson I learned from that experience was to have a good web host and purchase your domain names with a reputable source like GoDaddy.com. 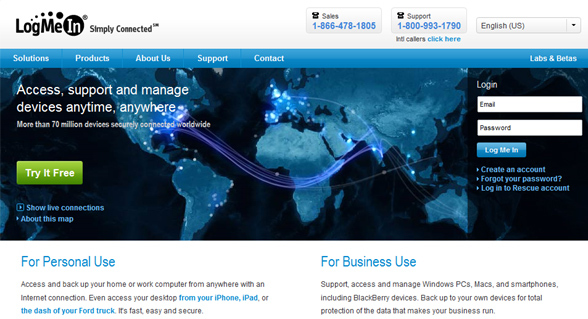 LogMeIn.com is a free (and paid) service that allows you to access computers from anywhere in the world and operate them remotely. Have you ever called for assistance on your home computer and had the operator working in Malaysia or Indonesia control your mouse and type with your keyboard. That’s exactly the type of thing that LogMe In does… and I use this service all the time. I use LogMe In to access my home computers when I am out on the road and I use LogMe In to operate my client computers when I am teaching them how to run their new websites or overcome a specific problem they might be having. Have you ever tried to tell someone over the phone how to do something on their computer? It’s frustrating and at times, almost impossible. With LogMe In, you’ll never again have that same problem. Simply log into their computer, operate it as if it were your own, and your on your way! While not entirely web-based, OpenX is a piece of free ad serving software that I use to run and track advertising campaigns on my various websites and Internet properties. OpenX allows me to put specific ads in specific spots during specific dates, and run ads in specific continents, countries, states or cities, which for many advertisers is incredibly important. The software also allows me to rotate multiple ads in a single spot, set ad priorities, and determine which ads are getting the best response. When it comes online advertising, OpenX is one incredible resource. Craigslist might not be a site many consider to be important for running an online business, but when your business is travel, Craigslist is a major player in regards to finding a place to stay. I use Craigslist’s category specific RSS feeds to find cheap and pleasant apartments when traveling overseas. Just find the country and/or city of your choice, click on the apartment listings, subscribe to the RSS feed, and then you will be notified almost instantly when new apartments or houses are posted to the site. This is the strategy I used to find my apartments while traveling through Europe last year… and it is the same strategy I plan to use on my upcoming adventures in 2011. When it comes to paying for expenses overseas, you want to make sure you have a credit card that isn’t going to charge you astronomical fees each and every time you make a transaction. If you have a Capital One credit card, there’s a good chance you’re in the clear! When I went to Germany for the first time in 2007, I used my debit card for all of my international purchases. The card worked great and I never had any problems, but when I got home and logged into my account, I was horrified at just how many extra fees and penalties I had received simply for using my bank card in another country. With my Capital One credit card, the fees simply don’t exist. And best of all, the Capital One website allows me to log into my account at any time, check my balance, view my transactions, download my monthly statements and even pay my bill online. Whether traveling at home or overseas, you need to be able to keep track of your finances while you are away. Lucky for me, my bank has gone digital and now I can not only keep track of my balance, but I can pay my bills, transfer funds between accounts, wire money internationally, and access my monthly statements from any computer in the world. There’s a good chance your bank has all of these features as well! It may be something you have to opt into, but they are services that really come in hand once you hit the road. When I need to purchase just about anything, one of the first places I look is Amazon.com. I’m a big reader, so I buy a lot of books from the site, but I buy a lot of other things as well. I’ve bought tents, backpacks, digital cameras and a whole lot more from Amazon.com. I use the site to shop when at home or overseas… and have actually had several items purchased from Amazon.com shipped to me while on my travels. Not only do I use Amazon for shopping, but I use the site to make money as well. The Bicycle Traveler’s Blueprint for the Amazon Kindle can be purchased from Amazon. And those with the Kindle can also subscribe to the Bicycle Touring Pro RSS feed. And when you click on this link (and other links like it here on BicycleTouringPro.com) and purchase something from the site, I make a small commission. Each and every month hundreds of people click the Amazon links on my various websites, which result in thousands of dollars worth of sales, which I then receive a small commission for and the money I make is then automatically deposited into my bank account. So you see, Amazon.com is just part of the way I am able to live wherever I want, travel whenever I please, and make money from anywhere in the world… whether I am awake or asleep. When it comes to selling things online, PayPal is my number one resource. I use PayPal to process credit card sales for physical products like bicycle mirrors and seat packs… and I use PayPal to facilitate orders for “The Bicycle Traveler’s Blueprint“ – my eBook on modern bicycle touring. With some of PayPal’s more advanced features I’ve been able to set up my business so that, for example, when someone purchases a copy of “The Bicycle Traveler’s Blueprint” their order is processed, their credit card is billed, an email is sent to me telling me that I’ve made a sale, and an email is automatically sent to the buyer telling them how to download the book. Once again, the process is entirely automatic and it happens 24/7, whether I’m in bed, in front of the computer or out riding my bike. Part of what makes The Bicycle Traveler’s Blueprint so successful is that the book also has an affiliate program, which is a system I created that allows anyone from anywhere in the world to promote the book and actually make money by telling other people about it. I use a little piece of software called iDevAffiliate to run my online affiliate program. With the software installed, I can have thousands of affiliates (people who promote my products) from all over the world. And when those people send other people to my website, the software tracks their actions. If one of the people my affiliates sent to my website buys one of my books, the affiliate gets credit for that sale and he or she makes money! Again, the process is entirely automatic (thanks to the iDev software) and I don’t have to do a thing except log into the iDev account every couple months and send out a few payments to my affiliate partners. Last year my computer crashed while I was in Switzerland and I nearly saw my entire life get flushed down the drain. I had thousands and thousands of dollars worth of valuable files on my computer and if I had lost them I would have been in big, big trouble. Luckily, I had remembered to back up my computer to an external hard drive a couple months prior, so I only lost about 2 months worth of work. After that incident, however, I became seriously concerned about losing my files ever again. And it was around this time that I signed up for a service called Carbonite, which automatically backs up all the files on my computer so I never have to worry about losing them. Backing up your important computer documents to an external hard drive is great, but the thing that makes Carbonite so wonderful is that the backup process happens automatically every time you connect to the Internet. You’re probably familiar with Flickr, right? Flickr is kind of like a social network centered around digital photographs. You can get a free Flickr account and post a few photos online to share with your friends and family, but I pay about $25 a year for the upgraded version of Flickr, which allows me to post as many photos as I want. These photos are then sorted into categories, sets and collections… and automatically appear in the sidebar of the BicycleTouringPro.com website. I mainly post photos from my travels to my Flickr account… and these photos serve two main purposes. 1) By posting photos from my own travels, it shows people that I do actually know what I’m talking about when it comes to world travel and bicycle touring… because they see my photos and know that I’ve done these things for myself. 2) My Flickr photos also tend to drive a large number of people back to the website here at BicycleTouringPro.com. They stumble across the photos on Flickr and then visit Bicycle Touring Pro to learn more about traveling with a bike. In much the same way that Flickr helps to draw traffic back to my website and establish me as some sort of bicycle touring expert, my videos on YouTube do very much the same thing. What I love about YouTube is just how easy it is to upload new videos and then share them online or embed them into my own websites. As of this writing, the Bicycle Touring Pro YouTube channel has received more than 100,000 views and continues to grow on a daily basis. I plan to post a lot more videos in the future! And finally, this list would not be complete without mentioning WordPress. For those who don’t know, WordPress is a free, open source Content Management System that was designed to make building websites super, super easy. BicycleTouringPro.com and every website I currently own is managed with WordPress software. The software is not only free, easy to use, and great at driving traffic through the search engines… but it comes with thousands of free plug-ins (additional pieces of software than can be used for a plethora of tasks). My favorite feature in WordPress, however, is the fact that I can schedule my blog posts in advance and have them posted to the website automatically. What this means is that when I go off on a trip, I don’t have to worry about the fact that I’m not able to update my website because I’m not in front of my computer. By scheduling my posts in advance, I can write a bunch of blog posts before I leave home on my travels, schedule them to post to the site on specific days and at specific times, and then know that they will be posted to the site while I’m away. For someone like myself, who is constantly on the road and away from home, this is an incredible feature and one that makes my enterprising nomadic lifestyle possible. So, there it is! That’s my list of 25 different web-based resources that I use to live and work from anywhere in the world and make money 24 hours a day, 365 days of the year. If you too are an Internet entrepreneur who works at home or on the road, what websites and software are you currently using to run your online business(es)? I’d be curious to hear! Let me know by leaving a comment below. This entry was posted in Bicycle Touring Pro Articles, Electronics, Featured How-To Articles, Lifestyle, Main Articles, Products, Tech and tagged affiliate program, amazon, aweber, bluehost, craigslist, dropbox, facebook, godaddy, google, logmein, online banking, openx, paypal, skype, spltweet, twitter, web based services, web browser, web software, wordpress. Great list of web services, thanks, very usefull. You speak about other web sites, is it possible to give us your other URL website ? Is it about bicycle traveling ? Most of the money I make online comes from my marketing/web design business at https://www.silvermountainmarketing.com. I also had another website that revolved around the use of social media, which I just sold this past week so I can concentrate more on Bicycle Touring Pro. And do you think your business around “Bicycle Touring Pro” could be enough to win your life one day ? Oh yeah. That’s the plan… to slowly weed out the marketing work so I can do the bike touring and world travel stuff all the time. I’m very close, but still working to get to where I want to be. Great summary and very helpful. Thank you! And good luck with your book. I hadn’t heard of Dropbox and Splitweet. Nice…. Thank you! Check out Purple Cloud webhosting…. very reasonable pricing, full service, no annoying ads…. I think Purple Cloud webhosting is really in Auckland…. I’m not sure. This is a great list. I use most of these same services myself. Though SplitTweet was a new one for me. I use TweetDeck, but that is a program on my machine. I was not aware of a way to manage multiple Twitter accounts online. This is a good find.